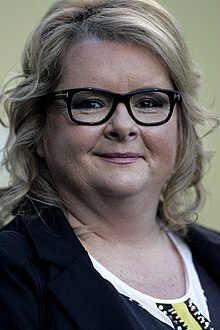 Magdalene Mary "Magda" Szubanski (born 12 April 1961) is an English-born Australian actress, comedian, television presenter, radio host and author. She is best known for her as Sharon Strzelecki in the television comedy show Kath & Kim. She also portrayed Esme Hoggett in the movie Babe (1995) and its sequel Babe: Pig in the City (1998). Szubanski was born in Liverpool, Lancashire. She is of Polish, Irish and Scottish ancestry. She moved to Melbourne, Victoria with her family in 1965. She came out as lesbian in 2012. ↑ "Gay-gay-gay-gay - Magda comes out". The Sydney Morning Herald. 15 February 2012. Retrieved 18 September 2015. Wikimedia Commons has media related to Magda Szubanski. This page was last changed on 18 September 2015, at 05:21.